Go to hell! No, that's not an insult, it's the point of the game! Grab all your friends and race towards the fiery pits of eternal damnation. 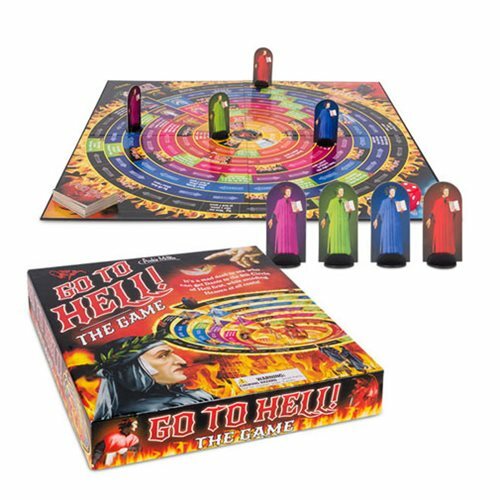 Be the first to make your way through all seven deadly sins and go to Hell! It includes one game board, one die, four game pieces and 20 Hell Cards. If you get sent to Heaven, your only bet is to get a Get Out of Heaven Free card. Do whatever it takes to get to the bottom, sinners welcome. This game comes in a 9 1/2-inch x 9 1/2-inch x 1 3/4-inch illustrated box. 1-4 players. Ages 14 and up.